Note: Includes 1 meter power cord, but you will need to purchase a grounded plug to wire onto it. Iwaki is one of the most dependable external pump on the market, well know for it's excellent quality. We carry the Japan motors (MD series). They are slightly more then theWMD american models, but pump is a little shorter and they ren cooler. So we feel it's worth the extra money. Some of the larger pumps will need a pig tail added to powercord. Note - IWAKI RLT are Pressure Rated pumps designed to pump into pressure canister filters or any situation that can create back pressure. IWAKI XT models are for standard circulation such as return from wet/dry. The pressure models are also suitable for standard return. Magnetic water pumps. Magnetic driven. 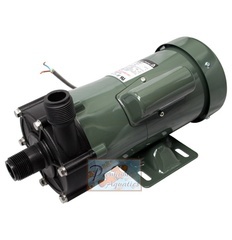 Sealess pumps for use on fresh or saltwater aquariums. Low heat exchange. Highly durable design. WMD pumps have American Made Motors. MD pumps have Japanese Made Motors. RLT pumps are for pressure applications. RLXT pumps are for circulation and wet/dry return. Iwaki Walchem magnetic drive pumps will run longer, quieter and cooler than any traditional mag drive. Extraordinarily high efficiencies make WMD & MD the clear choice in almost every process, recirculation or transfer application. Creates a positive, forced cooling path, lubricating bearing surfaces and actively purging gases & heat. Unique double bearing system allows cooling circuit liquid to continually "wash" front and rear radial bearings, extending bearing life. Pumps can be supplied with alumina ceramic or SiC spindles, bored, turned and highly polished. This precision machined spindle forms the center of the driven magnet. Substantially reduced hydraulic noise is a major feature of all WMD/MD impellers. Great pains are taken in the molding/finishing process to eliminate tangential misalignment. High lubricity fluoropolymer bearings minimize mechanical losses typical of conventional mag drive pumps. High purity SiC radial bearings handle the most aggressive ultrapure chemistries. PTFE front thrust surface aids hydraulic balance and minimizes flashing. Large rear thrust surface guards against axial forces caused by cavitation or gas entrapment. Dynamically balanced barium ferrite drive magnets provide best magnet torque. Die cast magnet carrier creates a flywheel effect, which adds to the magnet safety factor. Offering more standard motor/pump configurations than other manufacturers offer for tailored pump applications. Premium, high efficiency motors are used throughout the line. Totally enclosed, permanent split capacitor motors are compact, cool and economical. Tolerance to voltage variation without overheating and 50/60 Hz operation allow the product to be used in a worldwide market.